Prepare sauce mix according to package directions (including letting stand 10 minutes). Dissolve lemon-flavored gelatin in boiling water; add sour cream sauce, cold water, lemon juice, and dillweed. Beat till blended. Chill till partially set. Place green pepper, cucumber and carrot in blender container; cover with cold water. Cover; blend just until coarsely chopped. Drain well; stir chopped vegetables and chicken into gelatin mixture. Turn into 7 1/2 cup ring mold. Chill till firm. Unmold, fill center with fresh vegetables. Makes 8 servings. In medium saucepan combine one 3-ounce package lemon flavored gelatin, 1 envelope regular chicken noodle soup mix, and 1/2 cup frozen peas. Stir in 1 3/4 cups water. Cover and simmer 3 minutes. Stir in 2 tablespoons lemon juice. Chill till partially set. Fold in on 6 1/2 or 7-ounce can tuna, drained and flaked, and 1/3 cup chopped celery. Turn into four 3/4 cup individual molds or one 3-cup mold. Chill till firm. Unmold onto lettuce-lined serving plates. 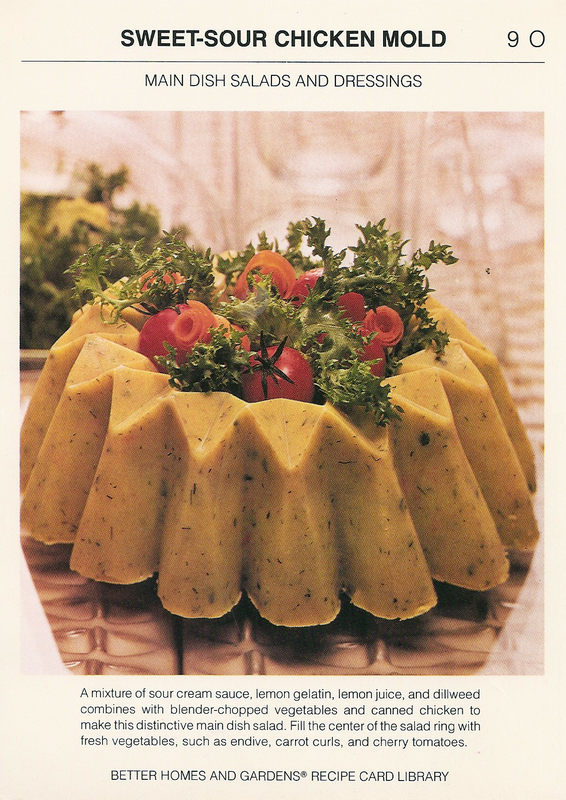 Serve with mayonnaise or salad dressing. Makes 4 servings. ©Meredith Corporation, MCMLXXVII. All Rights Reserved. Printed in U.S.A.